Visis to a record page. Each record landing page is enhanced with a box containing information about the usage statistics. An example is shown in the image below. All tracking is implemented in a way, that it is fully anonymized. Much more information about tracking details can be found in the relevant FAQ section. 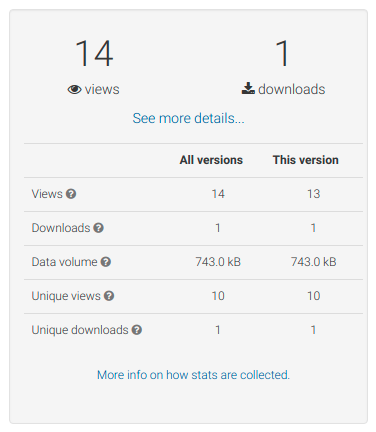 The usage statistics is also compliant with available standards such as the COUNTER Code of Practice and the Code of Practice for Research Data Usage Metrics. By following those standards it is possible to compare metris of other compliant repositories. Do not hesitate to provide feedback (both positive or negative) by contacting us.